To develop leaders who are critical thinkers and effective communicators, committed to service and rooted in faith. Established in 2005, John Paul II High School is the only Catholic high school in the greater Collin County area. Understanding that effective college preparation is fostered through formation of the whole person, a JPII student thrives in an academic community endowed with an exceptional faculty, small class sizes, and superior extracurricular offerings. 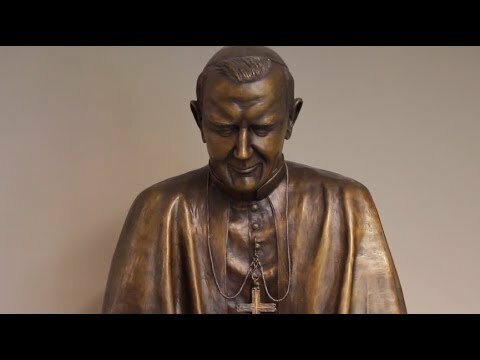 Inspired by our namesake, and bolstered by a 100% college acceptance rate, recipients of a JPII education graduate with the tools to become morally grounded, critically minded, and socially responsible leaders in our society. We serve one of the fastest growing and most dynamic communities in the United States. The greater Collin County area is global in perspective and reach, populated with leading companies in diverse industries and a highly educated workforce. As the area grows, so do the issues of socioeconomic disparity and poverty. At John Paul II High School, we are committed to forming the next generation of effective and ethical leaders who will make a difference in the world and the local community. The future truly belongs to the graduates of John Paul II High School.